"removals with storage our speciality great prices"
Moving home is a very personal matter, Arrowe Removals & Storage employ dedicated high quality staff, our customers will receive the best of attention at all times, it is a tribute to our staff that a large proportion of our work comes from recommendation from previous customers. Trusting complete strangers to take care of your home and its contents is never an easy decision to make, we sympathise with the way you feel, but it makes no difference whether you live in a small flat or a large detached house, every effort will be made to carry out a trouble free removal. The first step to moving is to invite our surveyor to call to your residence and prepare an quotation, he will make a careful assessment of the equipment, packing materials needed tailoring the service to your requirements. and storing house hold furniture and personnel belongs throughout the Wirral and beyond. while you are in between houses.
" 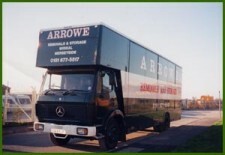 You Can Trust Arrowe Removals & Storage To Make The Right Moves". Copyright Arrowe Ltd Removals And Storage 2019©. All Rights Reserved.